Elmvale-Eastway-Riverview-Riverview Park West is bounded by Coronation and Industrial Avenues to the north, Walkley Road to the southeast and Smyth Road to the southwest, St. Laurent Boulevard and Russell Road to the east, and Alta Vista Drive and Dorval Avenue to the western borders. This neighbourhood was mostly farmland belonging to the Township of Gloucester until it was incorporated into the City of Ottawa in the 1950s. During this time, the neighbourhood was developed to accommodate the rise in the population following WWII. 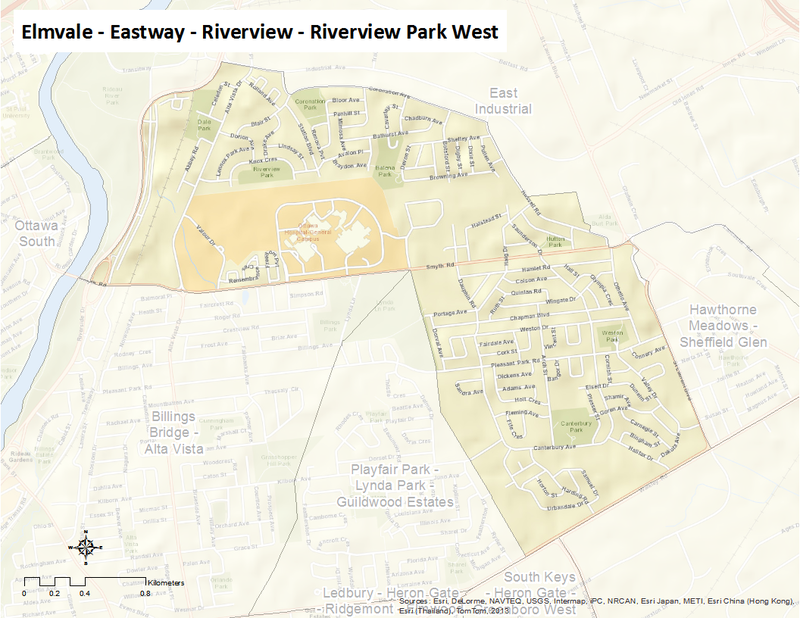 The neighbourhood includes the communities of Elmvale, Eastway, Riverview, Riverview Park and Blair Court. Here’s an infographic that describes the neighbourhood as a Village of 100 (2011 data).